According to the German Official History, before the greenish-yellow-white cloud of gas even reached the Allied trenches, the enemy infantry could be seen withdrawing after firing off a few shots. 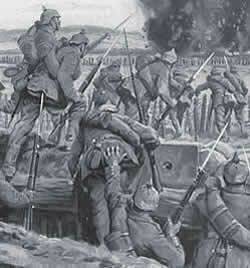 At precisely 5.15pm, following on behind the gas cloud, the German infantry began the attack. They clambered over the parapets of their forward trenches along a front of 9 kilometres. Many were wearing a gauze and cotton mask as protection from the gas. According to the German Official History the gas on the left wing of the German 45. Reserve Division, under the command of Generalleutnant Schöpflin, did not blow towards Steenstraat with complete success. The German advance was only able to make slow progress as it was up against artillery and infantry fire from the French and Belgian troops defending the line here. Units of the 46. Reserve Division, commanded by Generalleutnant Hahn, together with some troops of the neighbouring 45. Reserve Division, were able to make an advance towards the Yser Canal and the French held village of Steenstraat. But the fierce German artillery barrage opened up again and soon the 52. Reserve Division soldiers were on the move again behind it, heading in the direction of Pilckem Ridge. Pressing on they captured the French field gun batteries one after the other. In an attempt to rescue the French guns the horses and limbers were sent forward to the field gun batteries but were mostly destroyed before they could pull the guns away to the rear. Many of the French gunners were taken prisoner. Interestingly, this report does not mention the gas emitted 15 minutes before the Württemberger infantry attacked, which was the reason why the French soldiers were reacting with such panic. The situation to the east of 52. Reserve Division was more difficult. According to the German Official History on the front sector at Langemarck and east of Langemarck the gas had either not been completely effective or the German troops had not followed on immediately with their attack. The 51. Reserve Division troops, commanded by Generalmajor von Kleist, advancing in this sector came up against a stubborn defence from French infantry on the far right of the French line and Canadian troops on the left wing of the British line.